Helping Jonah - Helping Others was officially registered in January 2016. The purpose of the charity is to primarily raise funds for the ongoing medication required for Jonah - for which the States of Guernsey are no longer funding. Jonah was diagnosed with aggressive Leukaemia in June 2014 aged 15 and subsequently underwent a Bone Marrow Transplant in November 2014. During recovery he was then dealt a further devastating blow in August 2015 when he was diagnosed with a second life threatening illness known as aHUS - an ultra rare blood disease affecting the kidneys and other organs. The medication Jonah requires costs around £300 k per annum. We are raising funds to keep Jonah on this medication for as long as he needs it - it is now hoped by his medical team at Southampton that a 12 month course would be enough. Jonah therefore had his last dose administered on 20th September 2016. He will continue to be monitored every fortnight and have bloods taken to monitor his progress. If Jonah can remain off the medication this would be the best possible outcome and we can only hope that this will be the case. The charity will then continue to raise funds and help others. Fund raising initially started back in November 2015 and the support we have received to date has been simply phenomenal. It is every parent’s worst nightmare. One which you dare not even begin to imagine. But it happened to our family. Our son Jonah was suddenly and shockingly diagnosed with ALL (Acute Lymphoblastic Leukaemia) on 19th June 2014 just 2 days after being admitted to our local hospital by his GP during a follow-up visit for suspected Bells Palsy. He was 15 years old at the time – a lively, adventurous lad, studying for his exams, out riding his motorbike and in a relationship. A normal, healthy 15 year old - or so we thought. It was absolutely devastating, totally unexpected and life changing forever. Jonah was immediately flown off Island to Southampton in a critical condition where he remained for 3 weeks. We stayed by his side whilst family and friends rallied round back home to help out with his sisters, our pets and our family business. We had no control over anything. We were told the first couple of days were crucial in monitoring his chances of recovery. Thankfully, Jonah responded well to the initial endless bouts of chemotherapy, medication and lumbar punctures that he had to painfully endure. When he was strong enough he was allowed to fly home for a brief visit. However, back at an appointment in mid July we were given further devastating news in that Jonah’s cancer was so aggressive it kept coming back. His only chance was for a bone marrow transplant (stem cell transplant). Both his sisters, his Dad and I would be tested for a match. We flew out for testing, but none of us were suitable. A donor was then sought and amazingly a match was found through the Anthony Nolan Trust. Jonah was then to receive 4 x week long sessions of intensive chemotherapy each month in preparation for the transplant which was pencilled in for November. However, after the 3rd session his levels were still too high and we were given the awful news that they may not be able to go ahead with the transplant. We asked the inevitable and were told that Jonah would be able to return home and be made as comfortable as possible. It was the worst news that we wanted to hear, absolutely soul destroying and I'll never know how we got through the next couple of days. Miraculously however, the next set of blood results showed improvement and suddenly we were back on track for the transplant. We were to go to Bristol for the next session of intensive chemo and to meet the team who would then be carrying out the transplant. Jonah left Guernsey at the end of October 2014 and his treatment and conditioning started. He underwent his bone marrow transplant in Bristol on 28th November 2014 and we took it in turns to stay with him. We flew his sisters out for Christmas and other family members joined us. Jonah was allowed out of isolation and we spent it all together at the house provided by the Rhys Daniels Trust. It was one of the most memorable and magical Christmases we have ever had. Jonah remained in Bristol until 4th February 2015 when he was finally well enough to come back home to Guernsey. In early May Jonah and his younger sister both contracted a tummy bug and due to Jonah's poor immune system, he was admitted to our local hospital. Tests revealed that his kidney function was poor and as a result Southampton requested that he be admitted to them immediately. The weather that day was attrocious and Jonah was flown out that night via Search and Rescue Helicopter and his Dad travelled across via the ferry as no flights were available. Jonah was initially diagnosed with Ecoli and mention was first made of 'aHUS' - which was likely to have been caused by one of his medications. He was put on medication and his condition gradually improved. He remained in Southampton for 9 days before being allowed home after being given the all clear. Jonah remained well over the following months and continued to recover from both the bone marrow transplant and his recent illness. He spent the summer recuperating, catching up with family and friends and slowly piecing his life back together. His hair grew back and he began to look more like his old self. He started to regain his confidence which he had lost along the way. During routine blood tests in August, however, his levels showed that the aHUS had come back and he was immediately referred to the renal unit in Southampton. 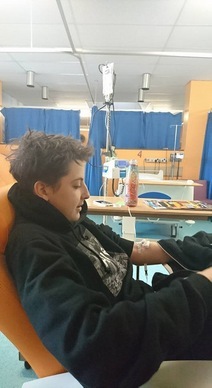 It was there that he was officially diagnosed with aHUS and we were informed that this was life threatening if left untreated and that the best medication for Jonah was Eculizumab - a very expensive drug which needed funding. Another nightmare was just beginning. We were devastated. Our hearts broke for Jonah. Jonah remained in Southampton for several weeks. The funding was turned down by Guernsey and Jonah's health deteriorated. The only other option was to undergo Plasma Exchange -Plasma Exchange is a patient procedure involving the separation and removal of the plasma from the blood in order to remove a disease substance circulating in the plasma. The red blood cells, white blood cells, and platelets are returned to the patient, along with a prescribed replacement fluid. This was to be done initially for 10 consecutive days and then every 3 days reducing to less frequent if possible. The procedure often took anything from between 4 - 9 hours and was very distressing for Jonah. However, during his 11th session Jonah had a reaction and developed fluid on the lungs and he was in a poor way. This happened again during the following two sessions and it was therefore decided to stop further treatment. It was only then during this stage that Guernsey agreed to fund 'for 12 weeks only' the use of Eculizumab. Their correspondence clearly stated "that this was to be funded as a rescue remedy only for Jonah's heart and would not be funded for any longer whatever the outcome." This was very hard to digest. Jonah received his first dose of Eculizumab on Friday 25th September 2015. Within days Jonah was showing signs of improvement and suffered no reaction to the medication. Just 7 days later he was given the OK to fly back home to Guernsey. He then received the medication fortnightly. His first 12 doses were administered in Southampton and as from February 2016 he received it at our local hospital - as Guernsey required clearance to bring the medication into the Island. His Dr did not believe it was genetic and in most cases patients with post bone marrow transplant HUS/TMA can eventually withdraw from Eculizumab therapy. We continued to raise funds by all means possible to ensure that Jonah got his medication for as long as he needed it. Over the following months Jonah made such fantastic progress. His Dr was so pleased and astounded by his recovery that he decided to trial a withdrawal from the medication. We are thrilled to say Jonah had his last dose on 20th September 2016. We have learnt to take each day as it comes and to be grateful for every day that comes.